It has been a double dose of transatlantic involvement for Jim Lauderdale lately. Not only did he play a major part in the success of the recent touring Sessions show which thrilled concert hall fans the length of the country, but a new album appears with a major imprint this side of the pond. LONDON SOUTHERN gives a big clue in the title of how this album came to life. Apart from recording it in the capital, a lifelong ambition of Jim, he hooked up with members of Nick Lowe’s team to produce a high calibre record streaked with a thick vein of substantive quality. 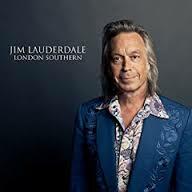 For many years Jim Lauderdale has been the crossover king of American music, albeit constantly switching between bluegrass, classic and contemporary country as well as pioneering Americana as a haven for homeless roots music. True to his eclectic nature, LONDON SOUTHERN rolls out as a mixture of sounds and even in the first three tracks we meander through the misty waters of classic country, lounge jazz blues and a soulful tinge. Maybe the album does steer down a middle line but it’s done in such as sophisticated way that it will warrant periodic plays and has potential to evolve into a slow burning standard. Two elements that contrast this release from THIS CHANGES EVERYTHING which appeared last year are this one has twelve new tracks split evenly between solo and co-write status, also its release on Proper Records will enable wider availability in the UK. A cacophony of studio sounds gives this record a hot coal appeal with plenty of horns, strings, piano and organ joining the ubiquitous guitar. An excellent track ideal for radio play opens the record with ‘Sweet Time’ being the standard bearer for classic country among the dozen. Elsewhere ‘We’ve Only Got So Much Time Here’ and ‘You Came To Get Me’ raise the soul stakes, while ‘I Love You More’ sees Jim in tear jerker mode. Rock ‘n’ roll gets a look in when the needle reaches ‘No Right Way To Be Wrong’ and ‘If I Can’t Resist’ is a pure smooth operator. A band of assumed considerable standing underpins the record creating an overall sound that invites you to sit back, relax and chill out to fine selection of songs. Possibly the missing elements to Jim’s involvement with the UK at the moment are the headline dates which would considerably build on the four or five songs he got to share in the Transatlantic Sessions shows. Showcasing LONDON SOUTHERN would best be served with some assembly of players which may be the stumbling block to arranging a tour, or at least a couple of high profile dates. However the alternative is to embrace the cheerful sounds on the various available formats that mark this new album as one to add to your valuable collection.